I was entirely too exhausted over the weekend to cook, but I did have the energy to throw together the FRESHEST fruit salad. I just mixed navel orange slices, the juice of the orange, organic strawberries and blackberries together. So simple. So delicious. I'm still not tired of tulips. Sorry. This week, they are peach. I found those wedges at Target for $24.99. PLUS they are comfortable. Jackpot. You can find them here. My photographer posted that pic of me to her company's Facebook page over the weekend. I can't wait to bust out that hat this summer! The salad, the tulips, gorgeous! Love that pic of you Tiff! Such fun pics!! 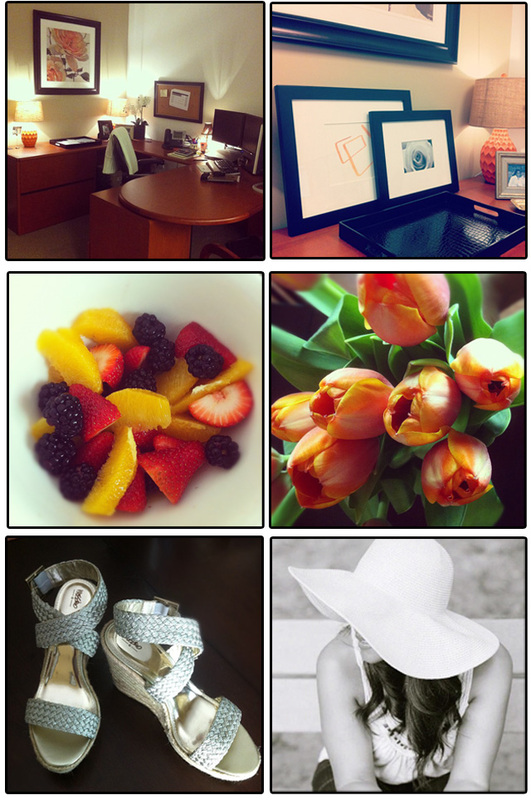 Love the tulips and fruit salad and I want those wedges!! Such a lovely journal, I might have to order one too! I'm a huge fan of the rifle paper co.
What beautiful pictures! And your new journal + tunic are gorgeous! Loving your office. Tulips are a favorite of mine, and that fruit salad looks delish! Love how you layered those pictures.....and those shoes..Target...really! Need.